“Donald Roy Thompson’s newest paintings... come alive on the wall. They marry with it, press tightly to it. Yet they remain distinct from the wall by virture of a strong black border; a bold outline that seems to compress the colour, bringing out its inner light: a sense of illumination that draws energy from both the irridescent glazed colours and the surrounding white of the illuminated wall." 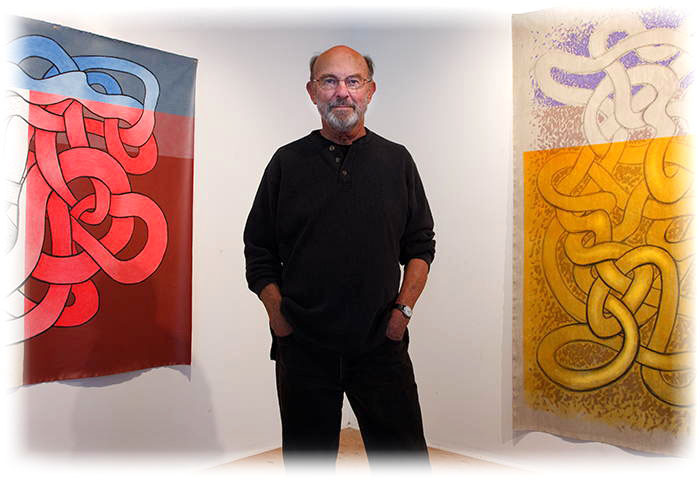 "Thompson’s work... began thirty-five years ago easily enough as flat colour-field abstraction and then evolved over the years into complicated sculptural reliefs..."
We invite you to explore Thompson’s work by clicking on the Recent and Past Menus above. All works on this site are for purchase. Don's most recent work is always an attraction for me as a collector. Its interesting to see his new initiatives in the art-making process always vital and exploratory, and within a series or a course of development. First impressions are enough to pivot me from workaday thinking to active looking. My awareness of new work increases proportionate to the challenges he sets forth on the surfaces and in his unmatched color creations. I once asked Don how he created the iridescent colors for Butterfly, the 48" x 48" x 7" painted constructed relief that I thought to be the best of a Relief Paintings exhibit (and that I soon added to my collection). He said that he couldn’t describe how he achieved the colors, and they would be impossible to match. Daily I have the satisfaction of bringing art and life together. I visually share with admiration the impeccable craftsmanship, and the edgy, conflicting surfaces found in Eagle, a horizontal 24 x 144 two-panel creation, or Ice Princess, from To The Wall: Recent Paintings exhibit, a 84 x 9" vertical panel with its deft brushwork and icy/hot color interaction. There is nothing precious or nostalgic here. There is nothing to confuse us with a storyline, or a narrative that refers to something outside of the art. Whether the work comes out from the wall or is flat to the wall, the focus is on the interaction of visual forces. I look for such works that have the potential to endure, like the art in museums, where the meaning is found in the quality of the image that is there, and in the sensibilities that the viewers bring to it. Don spends his time between Lynden Washington and Cortes Island BC Canada. 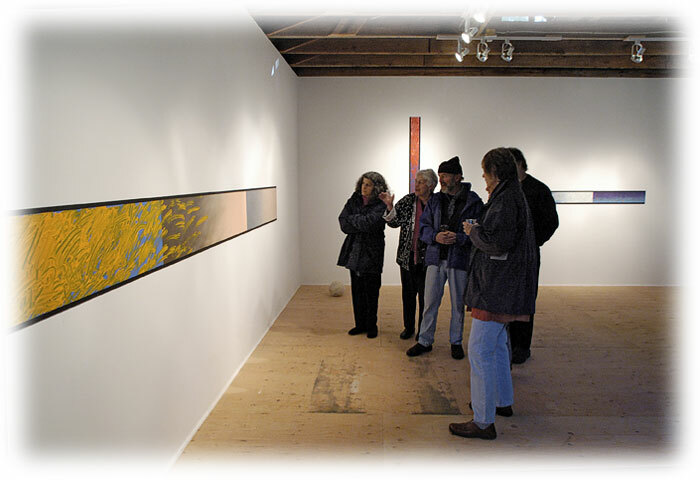 The pictures above are from two annual shows in his Cortes Island Studio. 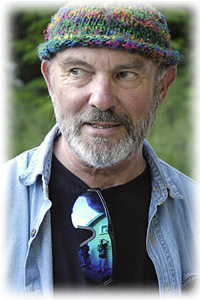 His partner and Artist's Assistant is Mary Dudley. She also organizes Eagle Wind Press on Cortes Island.